Copyright: © 2018 Chan YC, et al. This is an open-access article distributed under the terms of the Creative Commons Attribution License, which permits unrestricted use, distribution, and reproduction in any medium, provided the original author and source are credited. Chronic auditory sensorineural tinnitus is common in general population, especially in elderly. And, it was highly related with all types of sensorineural hearing loss, including noise-induced hearing and age-related hearing impairment. Traditionally, high dose salicylate injection in animals was a popular model for acute tinnitus . In acute tinnitus model, the accumulation of arachidonic acid, increased currents and/or mRNA expression NMDA receptor (NR) were reported [2-4]. In addition, inflammation and/or oxidative stress damages on the auditoruy and audiotry- associated system were related with salicylateinduced tinnitus [5-7]. Even though the study of chronic tinnitus is limited , the mRNA expression of NR genes has never been reported in a chronic tinnitus model to our knowledge. Matrix metalloproteinases (MMPs) are zinc-dependent enzymes that play a role in inflammatory responses, skeletal dysplasia, coronary artery and heart diseases, arthritis, cancer, brain development, dynamic remodelling of neuronal connections, and neurodegenerative diseases [9,10]. MMPs interact with NR in some disease conditions. For example, MMPs, and in particular MMP-3, are involved in the activitydependent alteration of NR1 structures at postsynaptic membrane specializations in the central nervous system . MMP-9- and NMDA-R1-mediated pathways were activated in diabetic kidneys . Further, MMPs (MMP-2/-9/-14) were associated with inflammatory neuropathic pain in damaged peripheral nervous systems [13,14]. However, the roles of MMPs in tinnitus are still unknown. MMP-7 is ssed in a variety of tissues including the brain. MMP-7 is a potent modulator of synaptic vesicle recycling and synaptic ultrastructure, and elevated enzyme levels may occur with brain inflammation and may adversely influence neurotransmission . MMP-7 could interact with NR in neurological diseases . Meanwhile, NR, inflammation, and/or oxidative stress were associated with tinnitus in an acute tinnitus model [4-7]. Thus, it is reasonable to hypothesize that MMP-7 gene expression might be associated with tinnitus. Spirulina platensis water extract (SP), which had anti-oxidative and anti-inflammatory effects [16,17], could reduce salicylate-induced tinnitus and expressions of NR2B and proinflammatory cytokine genes in the cochlea and brain of mice . It could also modulate the expressions of endogeneous antioxidant genes, and reduce malondialdehyde levels in many brain regions . However, the effects of the SP on the mRNA expression of NR2B, MMP-7, and inflammatory genes in chronic noise-induced tinnitus have not yet been reported. Therefore, we aimed to investigate this issue. Thirty-seven 3-month-old male C57BL/6 mice with normal hearing were initially included and fed a normal diet for this study. Institutional Animal Care and Use Committee of Providence University approved the protocol used in this study. The animals were housed in a temperature-controlled room with a constant 12-hr light–dark cycle. Food and tap water were freely available. First, all mice were trained for an active avoidance conditioning task in a conditioning box with an electrical floor according to the design of Guitton et al. and Hwang et al. [4,5]. The conditioning paradigm had six sessions per day for two weeks. There were 10 trials per session and lasted 15 to 20 min for one session. For each trial, the conditioning stimulus was a pure tone with a frequency of 10 kHz of 80-dB sound pressure level (SPL) and a 3-s duration. The unconditioned stimulus was a 3.7-mA electric foot-shock for 30 s . The time between the conditioned stimulus and unconditioned stimulus was 1 s. During training, the mice would climb into a safe area after the coupled conditioned and unconditioned stimuli. The mice were considered to be conditioned if they could reached at least 80% good response in three consecutive sessions. At the end of this training, we got 32 conditioned mice for next stage. All conditioned mice were administered 3 h of white noise involving 120 dB SPL to their left ear through an earphone with protection of their right ear after an intraperitoneal injection of sodium pentobarbital (65 mg/kg body weight). Then, tinnitus testing was performed 2 weeks after the noise exposure (tinnitus induction). An active avoidance task of one session was performed. The intensity of sound was adjusted to 100 dB SPL. By doing so, we could compensate for the possible noise-induced hearing loss of the right ear during chronic tinnitus induction. During testing, a 100-dB SPL pure tone of a 10-kHz frequency and a 3-s duration was administered first for 3 s in each trial, and the mice were observed if they could perform the task correctly. If so, the mice were put down for ongoing observation if the animals stayed inthe safe area for >10 s. If not, an electrical shock was given to remind the mice to climb up. Then, the mice were put down for ongoing observation. The, we calculated the total number of times the mice climbed into the safe area during the 1-min intertrial silent period within one session as the tinnitus score. Finally, we found that only 17 (of 32, 53.1%) mice had persistent tinnitus. Seventeen conditioned mice with persistent tinnitus were finally included in this study, and their tinnitus scores were regarded as baseline data. Further, they were randomly divided into two groups: control group (9 mice, normal diet) and Spirulina group (8 mice, normal diet with SP, 200 mg/kg body weight). The SP was supplied by Far East Bio-Tec Co, Ltd. (Taipei, Taiwan). All mice were fed a normal diet with/without SP for 80 days and were tested for tinnitus at the end of the study (the 80th day). Then, all mice were sacrificed for an mRNA experiment. At the end of the study, the mice were sacrificed by decapitation under general anesthesia with an intraperitoneal injection of pentobarbital (65 mg/kg). Pairs of the cochlea, brainstem, IC, and temporal lobes were immediately dissected using a Zeiss stereomicroscope and stored at-80ºC in a refrigerator until use. RNA isolation was performed using an RNA-Bee isolation reagent (Friendswood, USA) with a tissue homogenizer according to the manufacturer’s protocol. The RNA quality was assessed using an Agilent Bioanalyzer 2100, and the ratio of absorbance was measured at 260 and 280 nm using a NanoDrop. • β-actin F-5'-CCCACCCGCCACCAGTTCG-3', β-actin R-5'-CCCAT TCCCACCATCACACC-3'. The thermal cycling conditions for PCR were adjusted according to the following: 3-min initial set-up at 95ºC, followed by 50 cycles, each of which consisted of 45 s of denaturation at 95ºC; 45 s of annealing at 56ºC; and 72 s of extension at 72ºC. Further, the final 10 min included rest was set at 72ºC for all abovementioned genes. The DNA products were measured using a Mini Horizontal Electrophoresis System (MJ-105/MP-100, Major Science, Taiwan) and an E-Box-1000/26M Inspection Certificate & Analysis Systems (E-Box Spp-010 E-capt software, USA). The expression levels of NR2B and MMP-7 genes are presented as relative ratios in comparison to β-actin gene. Differences in tinnitus scores were calculated from those at day 80 minus baseline data obtained on the start day for each mouse in the two groups. Then, mean differences in tinnitus scores and mRNA expression levels for NR2B, MMP-7, TNT-α, or COX-2 genes relative to β-actin gene at each site were compared between the two groups using a Student’s t test. All abovementioned analyses were performed using the commercialized software “STATA10”, and p values of <0.05 were considered significant. There were 9 mice of control group and 8 mice of Spirulina group for tinnitus and gene xpression studies. No adverse events happened during all procedures. The Spirulina group (–6.3 ± 16.5) had a significantly lower mean difference in tinnitus scores (which were calculated using those obtained on day 80 and baseline data obtained on the start day for each mouse) than the control group (9.6 ± 13.3; p=0.0449). 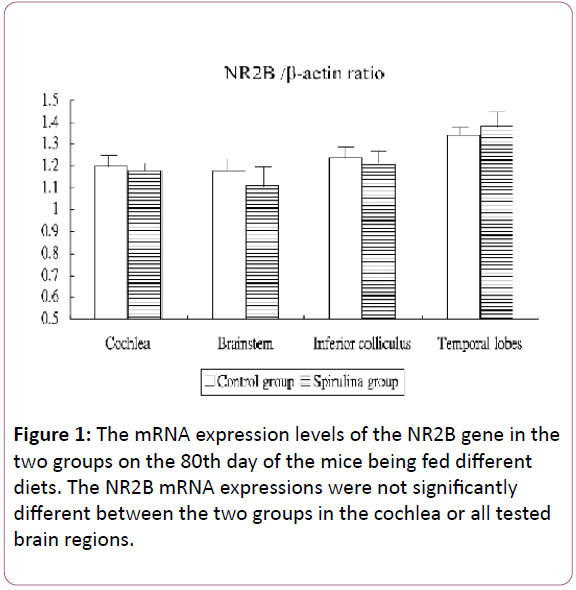 Figure 1 shows the mRNA expression levels of the NR2B gene in the cochlea and brain areas in the two groups on the 80th day of the mice being fed different diets. The NR2B mRNA expressions were not significantly different between the two groups in the cochlea (1.20 ± 0.05 for the control group vs 1.18 ± 0.03 for the Spirulina group; p=0.4257), brainstem (1.18 ± 0.06 vs 1.11 ± 0.10, respectively; p=0.0854), IC (1.24 ± 0.06 vs 1.21 ± 0.06, respectively; p = 0.3528), and temporal lobes (1.34 ± 0.04 vs 1.38 ± 0.08, respectively; p=0.7719). Figure 1: The mRNA expression levels of the NR2B gene in the two groups on the 80th day of the mice being fed different diets. The NR2B mRNA expressions were not significantly different between the two groups in the cochlea or all tested brain regions. Figure 2 shows the mRNA expression levels of the MMP-7 gene in the cochlea and brain areas in the two groups on the 80th day of the mice being fed different diets. Compared with the control group, the MMP-7 mRNA expressions in the Spirulina group increased significantly in the cochlea (1.15 ± 0.28 for the control group vs 1.82 ± 0.30 for the Spirulina group, respectively; p=0.0002) and temporal lobes (1.18 ± 0.26 vs 1.80 ± 0.20, respectively; p=0.0001) but were not significantly increased in the brainstem (1.09 ± 0.13 vs 1.15 ± 0.15, respectively; p=0.3808) and IC (0.99 ± 0.18 vs 1.23 ± 0.18, respectively; p=0.0053). Figure 2: The mRNA expression levels of the MMP-7 gene in the two groups on the 80th day of the mice being fed different diets. 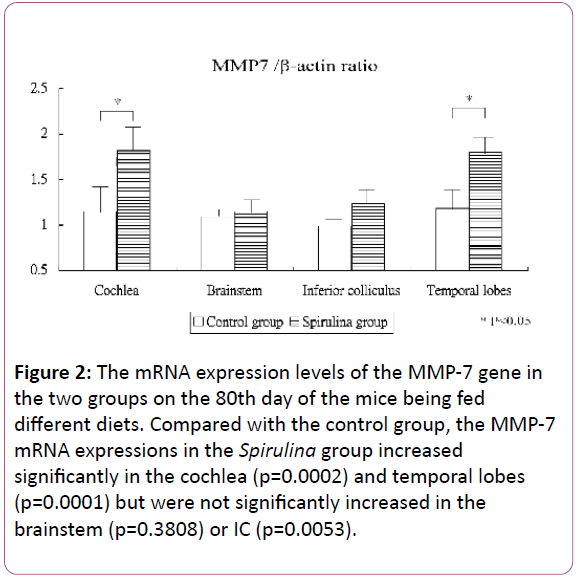 Compared with the control group, the MMP-7 mRNA expressions in the Spirulina group increased significantly in the cochlea (p=0.0002) and temporal lobes (p=0.0001) but were not significantly increased in the brainstem (p=0.3808) or IC (p=0.0053). 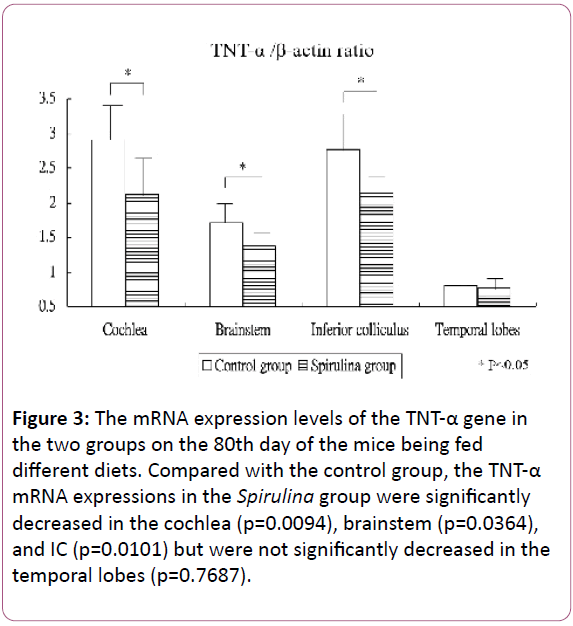 Figure 3 shows the mRNA expression levels of the TNT-α gene in the cochlea and brain areas on the 80th day of the mice being fed different diets. Compared with the control group, the TNT-α mRNA expressions in the Spirulina group decreased significantly in the cochlea (2.91 ± 0.53 for the control group vs 2.12 ± 0.56 for the Spirulina group; p=0.0094), brainstem (1.72 ± 0.35 vs 1.37 ± 0.27, respectively; p=0.0364), and IC (2.77 ± 0.56 vs 2.13 ± 0.25, respectively; p=0.0101), but not significantly decreased in the temporal lobes (0.81 ± 0.35 vs 0.77 ± 0.15, respectively; p=0.7687). Figure 3: The mRNA expression levels of the TNT-α gene in the two groups on the 80th day of the mice being fed different diets. Compared with the control group, the TNT-α mRNA expressions in the Spirulina group were significantly decreased in the cochlea (p=0.0094), brainstem (p=0.0364), and IC (p=0.0101) but were not significantly decreased in the temporal lobes (p=0.7687). 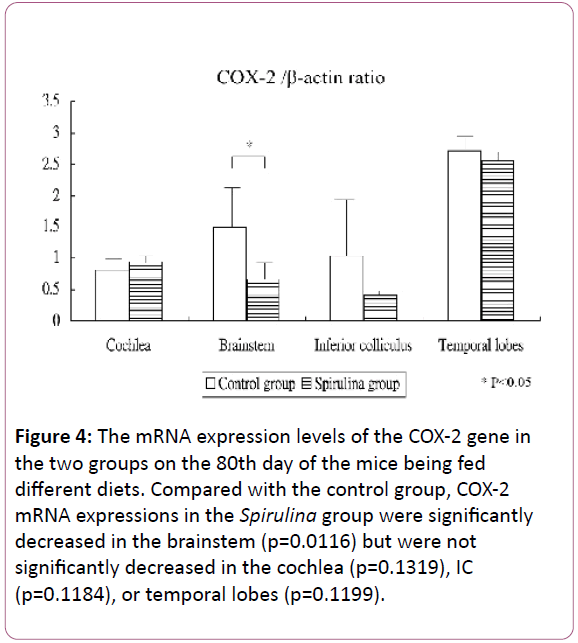 Figure 4 shows the mRNA expression levels of the COX-2 gene in the cochlea and brain areas on the 80th day of the mice being fed different diets. Compared with the control group, the COX-2 mRNA expressions in the Spirulina group were significantly decreased in the brainstem (1.49 ± 0.73 for the control group vs 0.66 ± 0.37 for the Spirulina group; p=0.0116), but not significantly decreased in the cochlea (0.81 ± 0.17 vs 0.94 ± 0.18, respectively; p=0.1319), IC (1.03 ± 1.03 vs 0.42 ± 0.08, respectively; p=0.1184), or temporal lobes (2.72 ± 0.24 vs 2.55 ± 0.16, respectively; p=0.1199). Figure 4: The mRNA expression levels of the COX-2 gene in the two groups on the 80th day of the mice being fed different diets. Compared with the control group, COX-2 mRNA expressions in the Spirulina group were significantly decreased in the brainstem (p=0.0116) but were not significantly decreased in the cochlea (p=0.1319), IC (p=0.1184), or temporal lobes (p=0.1199). This study showed that the induction rate for chronic tinnitus was 53.1% two weeks after a noise exposure in 3-month-old male C57BL/6 mice. SP supplement, which was started 2 weeks after tinnitus induction, could reduce tinnitus on the 80th day after entry (starting different diet) in this study. Further, SP could increase MMP-7 gene expression but decrease TNT-α and COX-2 gene expressions in the cochlea and/or some tinnitus-related brain regions. Studies on mechanisms and/or treatment effects in acute salicylate-induced tinnitus are numerous. For example, increased NR function was associated with salicylate-induced tinnitus . NR2A gene expression increased in the auditory cortexes of rats , but NR2B gene expression increased in the cochlea and IC in salicylate-induced tinnitus . SP downregulated mRNA and protein expression for NR2B, COX-2, and proinflammatory cytokines genes in the cochlea and IC during acute tinnitus . SP also modulated the expression of antioxidant genes and reduced oxidative damage in the cochlea and many brain regions during acute tinnitus . However, study of the mechanisms and/or treatment effects on chronic tinnitus is limited . The current study found that long-term treatment with SP could reduce chronic noise-induced tinnitus. Moreover, SP could increase the mRNA expression of the MMP-7 gene and decrease inflammatory genes, but not the NR2B gene, in this chronic tinnitus model. MMPs were involved in the dynamic remodelling of neuronal connections and some neurodegenerative diseases [9,10]. MMPs would interact with NR in some disease conditions. For example, MMP-7 disrupts dendritic spines in hippocampal neurons through NMDA receptor activation . Increased MMP-7 and MMP-3 levels modify NR function by cleaving the NR1 subunit in neurological diseases [10,11]. Activation of MMP-9 through neuronal nitric oxide synthase contributes to NMDA-induced retinal ganglion cell death . Furthermore, interaction between MPPs and inflammation was also observed. Elevated levels of MMP-7 that may occur with brain inflammation may adversely influence neurotransmission . MMP-9, TNF-α, IL-1β, and COX-2 were upregulated in injured sciatic nerves following a partial sciatic nerve ligation in mice [20,21]. After nerve injury, MMP-9 induces neuropathic pain through IL-1β cleavage and microglial activation early, while MMP-2, MMP-17, and MMP-24 gradually increase after nerve injury and maintain neuropathic pain through IL-1β cleavage and astrocyte activation later [21-23]. Increased gene expression or protein activity of MMPs seem harmful for cell functions in many diseases, but it may not be the whole story. For example, MMP-3 and MMP-9 gene expression and function increased transiently during water maze acquisition, which in large part were dependent upon NR activation. Further, MMPs are critical to synaptic plasticity and helpful for hippocampal-dependent learning . In our current study, we found that SP could increase MMP-7 gene expression but inhibit TNT-α and COX-2 gene expressions in chronic noise-induced tinnitus. It is acceptable to see a reduction in TNT-α and COX-2 gene expressions that were comparable with tinnitus reduction after treatment with SP. However, we did not expect to observe that MMP-7 gene expression paradoxically increased after long-term treatment with SP in mice with chronic tinnitus. This phenomenon might be secondary to hippocampal-dependent learning for the active avoidance task conducted in this study that was similar to the findings on MMP-3 and MMP-9 in a study by Meighan  involving water maze task. It might also be associated with synaptic plasticity for chronic tinnitus; more study, including clinical trial, is necessitated to confirm our hypothesis in the future. This animal study provided new information: the induction rate for chronic tinnitus was 53.1% two weeks after noise exposure in 3-month-old male C57BL/6 mice. Long-term supplementation of SP could reduce chronic tinnitus, increase MMP-7 gene expression, and decrease TNT-α and COX-2 gene expression but did not alter NR2B gene expression in the cochlea and/or some tinnitus-related brain regions. However, the role of increased MMP-7 mRNA expression in chronic tinnitus should be further investigated in the future. Yin-Ching Chan conducted analyses, performed data interpretation, and wrote the first draft of the manuscript, Tzu- Ying Wu performed the manuscript and Juen-Haur Hwang Designed the study, and supervised the intellectual content. This study was supported by grants from the National Science Council, Taiwan (NSC- 100-2313-B-126-002). Institutional Animal Care and Use Committee of Providence University approved the protocol used in this study. Jastreboff PJ, Brennan JF, Sasaki CT (1998) An animal model for tinnitus. Laryngoscope 98: 280-286. Guitton MJ, Caston J, Ruel J, Johnson RM, Pujol R, et al. (2003) Salicylate induces tinnitus through activation of cochlear NMDA receptors. J Neurosci 23: 3944-3952. Jia MH, Qin ZB (2006) Expression of c-fos and NR2A in auditory cortex of rats tinnitus. Zhonghua Er Bi Yan Hou Tou Jing Wai Ke Za Zhi 41: 451-454. Hwang JH, Chen JC, Yang SY, Wang MF, Liu TC, et al. (2011) Expression of COX- and NMDA receptor genes at the cochlea and midbrain in salicylate-induced tinnitus. Laryngoscope 121: 361-364. Hwang JH, Chen JC, Yang SY, Wang MF, Chan YC (2011) Expression of TNF-alpha and IL-1beta genes in the cochlea and midbrain in salicylate-induced tinnitus. J Neuroinflamm 8: 30-36. Hwang JH, Chen JC, Chan YC (2013) Effects of c-phycocyanin and spirulina on salicylate-induced tinnitus, expression of NMDA receptor and inflammatory genes. Plos One. 8: e58215. Hwang JH, Chang NC, Chen JC, Chan YC (2015) Expression of antioxidant genes in the mouse cochlea and brain in salicylate-induced tinnitus and effect of treatment with Spirulina platensis water extract. Audiol Neurotol 20: 322-329. Turner J, Larsen D, Hughes L, Moechars D, Shore S (2012) Time course of tinnitus development following noise exposure in Mice. J Neurosci Res 90: 1480-1488. Malemud CJ (2006) Matrix metalloproteinases (MMPs) in health and disease: an overview. Front Biosci 11: 1696-1701. Szklarczyk A, Ewaleifoh O, Beique JC, Wang Y, Knorr D, et al. (2008) MMP-7 cleaves the NR1 NMDA receptor subunit and modifies NMDA receptor. FASEB J 22: 3757-3767. Pauly T, Ratliff M, Pietrowski E, Neugebauer R, Schlicksupp A, et al. (2008) Activity-dependent shedding of the NMDA receptor glycine binding site by matrix metalloproteinase 3: a PUTATIVE mechanism of postsynaptic plasticity. PLOS One 3: e2681. Kundu S, Pushpakumar S, Sen U (2015) MMP-9- and NMDA receptor-mediated mechanism of diabetic renovascular remodeling and kidney dysfunction: hydrogen sulfide is a key modulator. Nitric Oxide 46: 172-185. Henry MA, Fairchild DD, Patil MJ, Hanania T, Hain HS, et al. (2015) Effect of a novel, orally active matrix metalloproteinase-2 and -9 inhibitor in spinal and trigeminal rat models of neuropathic pain. J Oral Facial Pain Headache 29: 286-296. Nishihara T, Remacle AG, Angert M, Shubayev I, Shiryaev SA, et al. (2015) nMatrix metalloproteinase-14 both sheds cell surface neuronal glial antigen 2 (NG2) proteoglycan on macrophages and governs the response to peripheral nerve injury. J Biol Chem 290: 3693-3707. Szklarczyk A, Conant K, Owens DF, Ravin R, McKay RD, et al. (2007) Matrix metalloproteinase-7 modulates synaptic vesicle recycling and induces atrophy of synapses. Neuroscience 149: 87-98. Romay C, Ledon N, González R (1999) Phycocyanin extract reduces leukotriene B4 levels in arachidonic acid-induced mouse-ear inflammation test. J Pharm Pharmacol 51: 641-642. McCarty MF, Barroso-Aranda J, Contreras F (2010) Oral phycocyanobilin may diminish the pathogenicity of activated brain microglia in neurodegenerative disorders. Med Hypotheses 74: 601-605. Bilousova TV, Rusakov DA, Ethell DW, Ethell IM (2006) Matrix metalloproteinase-7 disrupts dendritic spines in hippocampal neurons through NMDA receptor activation. J Neurochem 97: 44-56. Manabe S, Gu Z, Lipton SA (2005) Activation of matrix metalloproteinase-9 via neuronal nitric oxide synthase contributes to NMDA-induced retinal ganglion cell death. Invest Ophthalmol Vis Sci 46: 4747-4753. Chattopadhyay S, Myers RR, Janes J, Shubayev V (2007) Cytokine regulation of MMP-9 in peripheral glia: implications for pathological processes and pain in injured nerve. Brain Behav Immun 21: 561-568. Zhang FF, Morioka N, Harano S, Nakamura Y, Liu M, et al. (2015) Perineural expression of high-mobility group box-1 contributes to long-lasting mechanical hypersensitivity via matrix metalloproteinase-9 upregulation in mice with painful peripheral neuropathy. J Neurochem 136: 837-850. Kawasaki Y, Xu ZZ, Wang X, Park JY, Zhuang ZY, et al. (2008) Distinct roles of matrix metalloproteases in the early- and late-phase development of neuropathic pain. Nat Med 14: 331-336.
of nociception-related spinal cord matrix metalloproteinase expression in a murine neuropathic pain model. J Chin Med Assoc 76: 201-210. Meighan SE, Meighan PC, Choudhury P, Davis CJ, Olson ML, et al. (2006) Effects of extracellular matrix-degrading proteases matrix metalloproteinases 3 and 9 on spatial learning and synaptic plasticity. J Neurochem 96: 1227-1241.